"Seriously. The kids have an abundance of toys. They can't have more." And welcome to our latest Kinfo newsletter (see others here). Do you remember being kids yourselves? 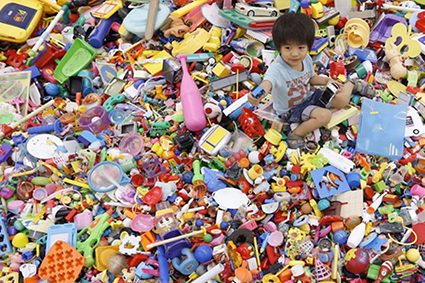 So we remember just how important toys are to kids. Yet when they are quickly discarded, no longer funny, or so-last-year, it's easy to feel over them. One option would be to keep buying more, the other, is to just buy less? This week, we have picked a few ideas to help streamline your purchases. Oh, and our competition to win a £100 voucher to spend on Kinfo is still running until Dec 20th so hurry up if you have something to share – toys and games included. 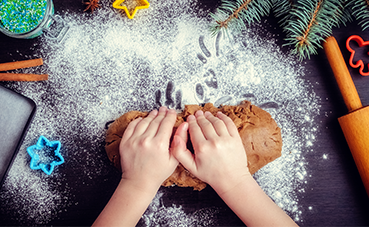 The festive season is the time for home-cooking and sticky fingers. Kids usually love participating in spoon-licking and liquid-pouring, especially. One child is going to love what Santa's bringing this Christmas: a cooking set! "An activity you can share, while cultivating a love of an important life skill," says Sarah. Find more from this "inclusive cook" – with tips, advice and recipes in an interview with Kinfo here. "Great for reluctant readers" says a mum of 2 on Kinfo about this classic comic. It is delivered every week straight to your door before it hits the shops. The Beano is the longest-running British children's comic and its characters include Dennis the Menace, Minnie the Minx, The Bash Street Kids, Roger the Dodger etc. Subscribe here and get your first issue in time for Santa's delivery. A personalised box of art and craft material that arrives through your letter box every other week. 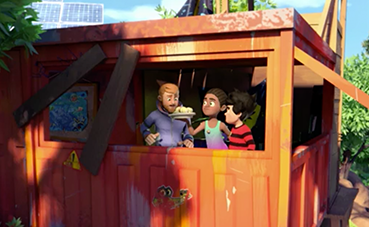 This mum of 3 recommends it on Kinfo. "Very well done," she says. 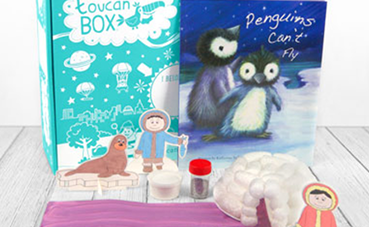 Inspired by Montessori learning, each toucanBox is built by educational experts to develop key skills. Choose from three box sizeshere and your first one should arrive in time for Christmas. A shop where you will find anything you want to sew, knit, or quilt. One mum of 4 says that her children "love going there and always have ideas of things to make". Perhaps Santa would be inspired here! 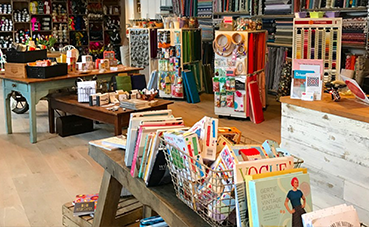 Located at West Hampstead Square, this modern craft shop wants to inspire everyone who walks through their doors. We bet we will be! This is recommended by a mum of 2 on Kinfo as one of the best balanced (stable), solid (won't break the next day), colourful (to appreciate its speed) and wide-axel (making it easier to catch) version of this game. This will teach kids patience and co-ordination. 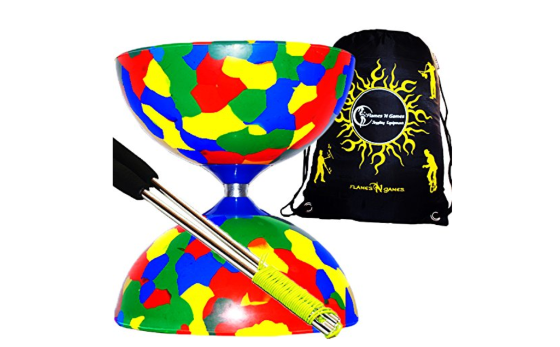 Just make sure to move your precious china before letting your child enjoy his or her journey to becoming a Diabolo master. 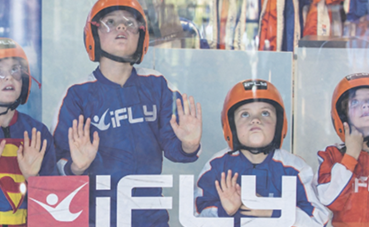 No need to go out shopping for this great present: an experience of flying! It is recommended by a mum of 2 on Kinfo whose daughters received it last Christmas from their "very creative" godmother. Tempted? Click herefor gift-vouchers or special Kick-Start offers. 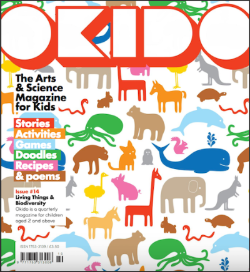 Together with Whizz Pop Bang, Okido, the art and science magazine for young kids, has been recommended by Kath (see her interview for Kinfohere). Her children were delighted to receive them "in their own name" through the letter box last Christmas. Award-winning monthly science magazine for the 6 to 11-year-old wizards, this is another great magazine that children love. 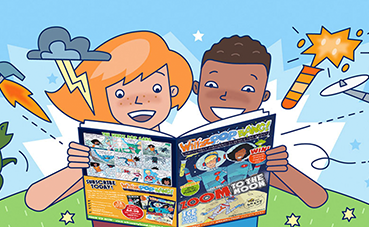 Packed with hands-on experiments, bite-sized information and eye-catching illustrations, it's also ad-free. There is a special offer if you subscribe by Dec 17th, here. Role play is a key activity for children. It stimulates their imagination, helps them to solve problems and encourages friendship through "turn-taking". What's more fun for some than doing what we were all doing when they were small... (These "toys" might even be better than the ones we used!). Recommended by a mum of 2 in Kinfo, she loves "the attention to detail, high-quality materials and the fact that the handlebar was adjustable". 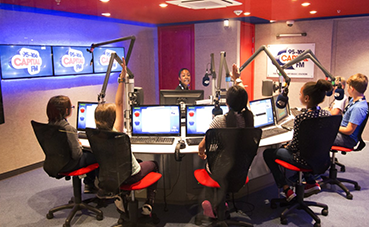 Talking about role play, here is another idea: with more than 60 real life entertaining activities, Kidzania is an "indoor city run by kids". Recommended many times by parents on Kinfo, this is the ultimate place in to act out different roles. Your child will be a nurse, a pilot, a chef, a singer, a police(wo)man, a fire(wo)man or a car engineer. Buy a gift voucher here and put it in an envelop under the Christmas tree. Success guaranteed. 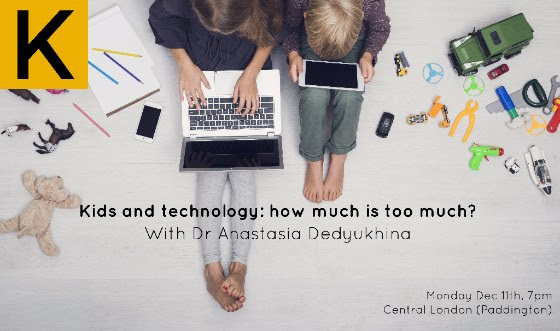 Join us next Monday to learn how to enjoy a good tech/life balance, with expert Dr Anastasia Dedyukhina. Hear how tech is changing kids' brains, their ability to take decisions and creativity. Plus practical tips on how you can manage screen time and avoid addiction. For example, how to define space and time with no tech" that will help your kids understand that they don't actually need it to have fun. A few places are still available. Book here.